This is part of the material preserved by Mrs Edith Fisher the then Parish Clerk of Harvington. They were found in the attic of her house when it was being insulated at 7 Ragley Road Harvington where she lived until she died at the age of 93 in 1998. Her daughter Rosa and granddaughter Gillian wish these documents to be published for the village. The material has been copied by Gillian as 54 pdf files and has been published and placed on the webpage called Parish Council. Coronation Minutes 1952-54 - an A5 exercise book of parish council notes relating to a coronation party held in 1953. The minutes were taken between the 11th November 1952 and 8th March 1954. 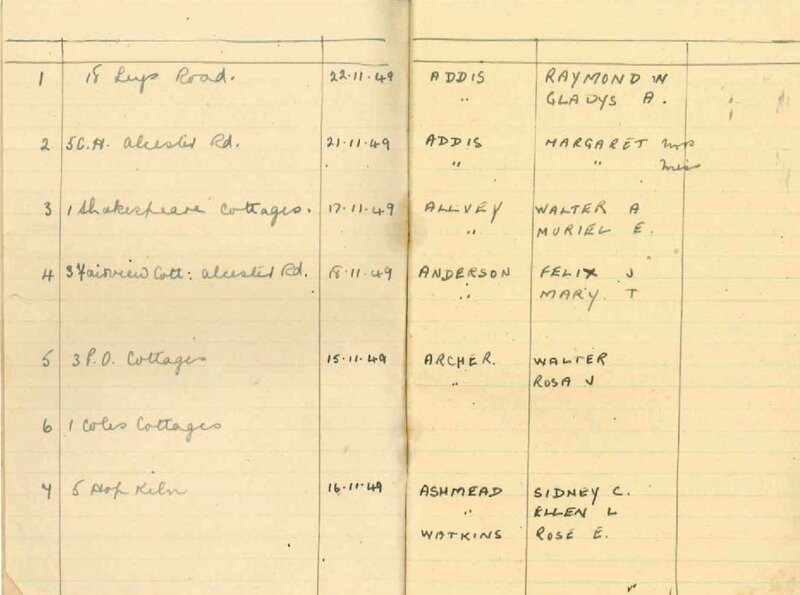 List of Residents 1949 - a small exercise book containing an electoral role of the village recorded, mostly in alphebetical order, between 11th November and 1st December 1949. 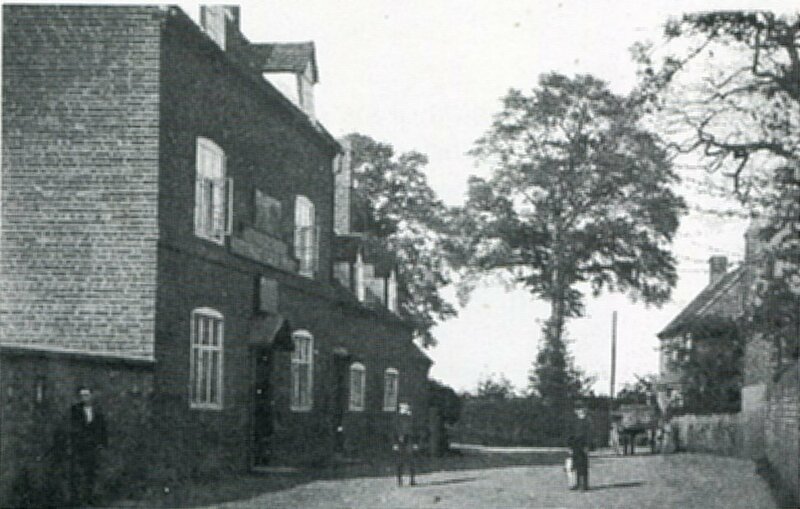 Street Lighting - a number of documents relating to street lighting in the village in 1963. Transcribed and arranged by Julian Rawes, Crooked Walls & Bryant Bayliffe of Brockworth, Glos. The original version is arranged in alphabetical order by head of the houshold. It is therefore not so easy to use as if it was in order of surname or by address. To make it easier for the viewer the information has been arranged in several ways within a database format. 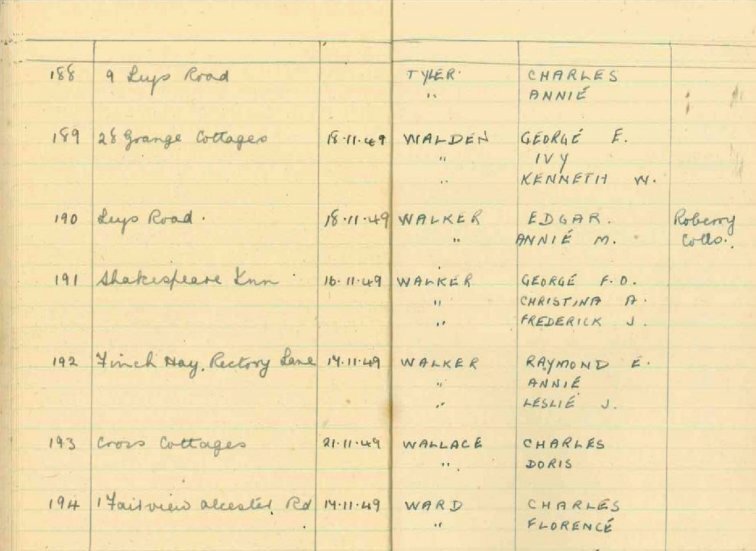 It has been necessary to make a number of alterations and additions to the original version to make the data appear correctly, such as replacing ' " ' with the full surname and adding and altering the address so that the material would index correctly. The 'Reference' number contains numbers 1 to 210 by household with inhabitants numbered 1,2,3 etc. Extra material by the editors is to be found within [ ] brackets. CH stands for council house. For the pdf files choose open rather than save.